22 | November | 2008 | can i just finish my waffle? Could Obama pass the background check and vetting process he is imposing on potential administration officials and high-level advisers? I doubt it. It is reported they are subjected to an unprecedented degree of scrutiny. Ironic, isn’t it, when he still has questions floating around about as basic a question as his citizenship. Examples: Embarrassing e-mails, text messages, diary entries and Facebook profiles? Gifts worth more than $50, other than those from relatives and long-standing friends? Family members with connections to Fannie Mae, Freddie Mac, AIG, or any other company receiving a federal bailout? In addition to the already invasive FBI background check, the Obama team is requiring prospective candidates to complete a seven-page questionnaire that requires the disclosure of nearly every last private detail. In addition to the obvious questions involving past criminal history, candidates are asked about personal diaries, past blog posts, and the financial entanglements of extended family members. “This questionnaire they’ve been giving to people who are thinking about signing up for a government job is extremely invasive,” said David Gergen, a CNN senior political analyst and adviser to four past presidents. 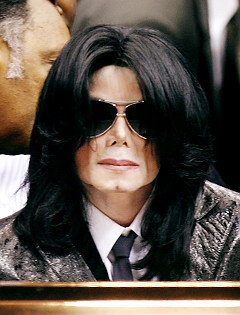 Ever wonder what would be next for Michael Jackson? He has reportedly converted to Islam and changed his name to Mikaeel after one of Allah’s angels. Jackson, 50, was raised a Jehovah’s Witness. He pledged allegiance to the Koran in a Shahada ceremony (the Muslim declaration of belief) presided over by an Imam. Cat Stevens, who famously converted to Islam and now goes by Yousef Islam, was on hand to celebrate the conversion. When asked about the auto industry problems, he dodged the question. 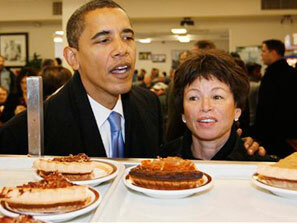 “I got the corned beef,” I think he picked the cherry pie, too.